A note to subscribers: Google Reader will shutdown on July 1st, 2013. If you have a subscription to this blog through Google Reader, please sign up for email notifications, or switch to another reader. I recommend Feedly or Bloglovin. They will automatically retrieve all your Google reader subscriptions. We like to have a small bowl of fruit before we go to bed, often while watching a re-run of Law and Order. Actually, I should say Phil loves to have a bowl of fruit, he always offers to make one for me, I decline. Then we end up sharing. 😉 Sometimes we have apples & diced walnuts, sometimes sliced bananas, or blueberries & yogurt, but these days strawberries are the best choice. With ice-cream season starting, I showed my gratitude for countless evenings of hitting his bowl of fruit by making a batch of frozen strawberry yogurt. Very little sugar added, non-fat yogurt, this is as light as a dessert can be. If you have a sweet tooth, this may not be for you. Although you can always cover it with some chocolate sauce… it won’t hurt our feelings! 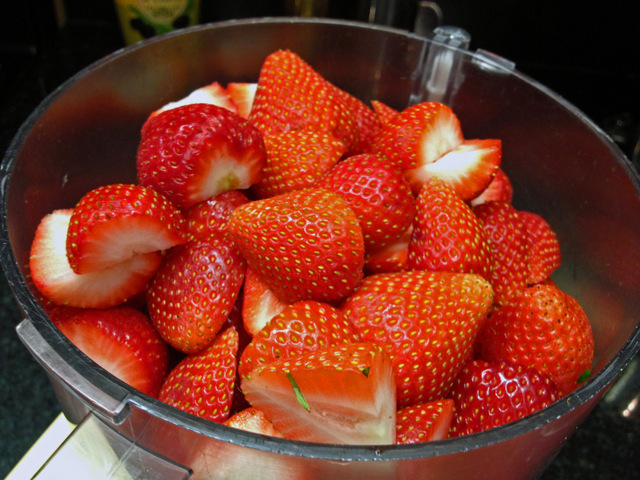 Place berries in a food processor and process until smooth, scraping down the sides as necessary. Add sugar and orange juice; process for a few seconds. Add yogurt and pulse several times until blended. Transfer to a bowl. Cover and refrigerate until chilled, about 1 hour or overnight. 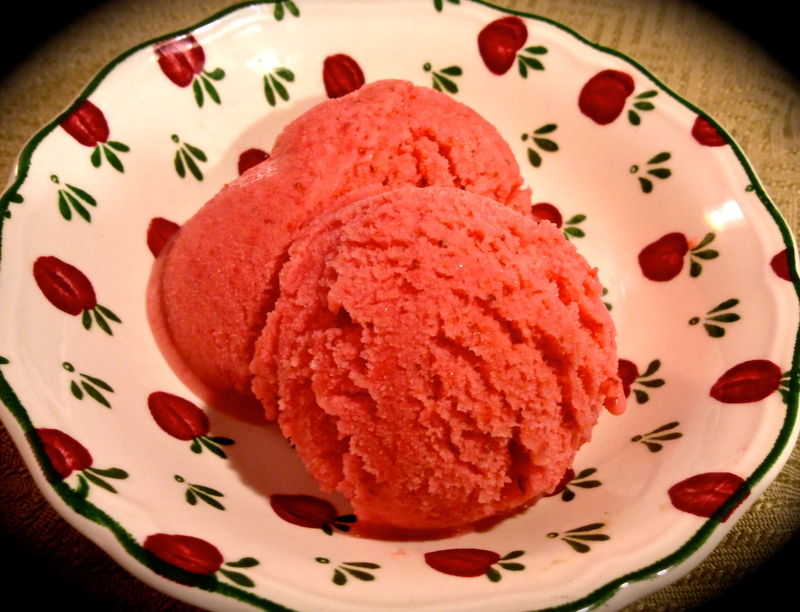 Pour the strawberry mixture into an ice cream maker and freeze according to manufacturer’s directions. Serve immediately or transfer to a storage container and let harden in the freezer for 1 to 1 1/2 hours. A word about Kitchen Daily: I discovered this site by one of those fortunate accidents while net-surfing. Just like Everyday Food from Martha Stewart, this site offers a daily recipe arriving in your mailbox. For the most part, everything quite compatible with our style of cooking. If you want to check their website, and maybe join their daily feed, jump here. Very timely recipe, Sally. I made a version of this last summer using peaches and full-fat Greek-style yogurt. Delicious and almost as creamy as “real” ice cream. And when using the full-fat yogurt, I found I was satisfied with about half the amount I’d want if it were no-fat. Oddly, though, if you give me full-fat ice cream, I will want the whole bowlful! Oh yes, HD Dulce de Leche is a real weakness for me too! Hey, let’s experiment and make that ourselves! I already have a really easy base ice cream recipe, and if we can figure out how to get the dulce de leche part in there, we’d be golden! I won’t be able to work on it until after June 14th (moving! ), but I promise to try it then. On, my…. ok, let’s work on it! Sounds like a dangerous proposition, but I’m up for it! Sally: This is one of my favorite recipes of yours. It is easy and quick to make, and looks absolutely freshlicious. I’ll be surely trying this summer. My girls will be thrilled and myself too!!! If they like things very sweet, maybe you should increase the sugar a little? Taste the mixture and decide how you like it. It is such a simple recipe to put together, we loved it! Sounds like a delicious and healthy frozen treat for the summer. Home-made dulce de leche… now you’re talking! 😉 My Mom used to make it with the pressure cooker, many Brazilian homes would have home made “doce de leite” when I was growing up. It’s delicious! Well, despite the fact that strawberries don’t really come into season here until July (I know, too funny…), I’m totally enjoying all the strawberry posts floating around the blogosphere including this delicious looking frozen yogurt! Happily, it has been very warm (yay ;-)) so the timing of this delightful treat is also perfect. I hope you had a nice weekend Sally! This sounds delicious, Sally, and has me regretting walking past the season’s first strawberries at the farmers market yesterday. Like, too, that it won’t create a quart of two. In this house, whatever ice cream I make, I eat. Less is definitely enough! Thanks! It is indeed ice cream season! All things frozen are just what I want lately. And, with strawberries, who could resist this? Yummy indeed… we have JUST a little amount left now… time to make some more, but I’m thinking of trying another flavor.. I think it’s a good idea to try the base before freezing and see if you need more sugar. I also wonder if a little agave nectar or maple syrup could work here… hummmmm… so many experiments! Very simple to prepare, which I love… hope you try it! What a light and lovely dessert Sally! I have been loving the strawberries this season…we always have at least a pound in our fridge, and I plan on making this very very soon. The color is so vibrant, and I’m sure it tastes incredible. I whipped up a creamy, tangy bowl of ice cream, a bowl of ice cream that sits just as comfortably beneath a topping of granola as your morning bowl of Yoplait or Chobani or your afternoon serving of Pinkberry. It contains yogurt, but it’s not frozen yogurt. It’s full of cream, but it’s not over-sweet.